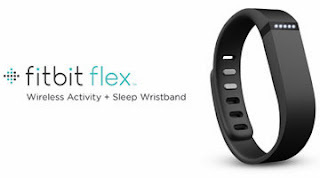 The Flex is the latest fitness monitoring product from Fitbit with a interchangeable wrist strap as well as water resistant electronics than may be worn in the shower or anywhere with brief contact with water. These features, however come at a price of reduced functionality compared with the One or Ultra and is more like the lower end Fitbit Zip. The Flex uses the same iOS App and dashboard as the other Fitbit products and can be synced via a USB dongle or directly to your Bluetooth 4.0 iPhone or iPad but does not have a digital display. To see the actual steps you’ve taken for the day, you’ll need to use the app or view your progress on the Fitbit website. A series of 5 dots on the Flex tells you how far you’ve made progress towards your goal throughout the day (Five solid dots indicate you’ve met your goal). Without that display you also lose the stopwatch function, which was a very important part of my workouts. The Flex does not measure stairs, unlike the Ultra or One, but does measure sleep and provides a vibrating wake up alarm and sleep quality monitoring. It seems to sit slightly above the Zip but slightly below the One in the product line (though pricing is the same as the One). Also because you wear it on your wrist, it didn’t register movement on an elliptical trainer, but when I put it in my pocket it worked fine. I’ll admit I was first very disappointed with the Flex’s inability to provide immediate readout and track stairs, but I gave up my obsession with knowing the exact number of steps and became satisfied accepting the simple progress bar on the device. Not having to worry about my Fitbit going through the washing machine and leaving it at home is a strong selling point even with a lack of features. As I wore it, others noticed and I was able to increase the number of people I competed with in the program. A solid and reliable addition to the Fitbit product line to motivate you to stay fit. Article was republished by the Lawrence Apple User's Group 2.0 here as well as other groups listed on the right.